The Hallmarking Act 1973 confers a duty on the British Hallmarking Council to take all steps appearing to be open to it for ensuring enforcement of the law with respect to hallmarking (s13(1)) and to assist enforcement authorities accordingly (s13(2)). The guidance set out below is issued in the exercise of these functions. On 24th October 2011, Southampton Trading Standards contacted the British Hallmarking Council for advice in relation to products being sold in the UK using the term ‘bonded gold’. The Trading Standards Office was also concerned about the marking of some of the product with the inscription 925 1/20 10K which they thought was potentially misleading to the UK consumer and also because 10K (carat) was not an accepted fineness in the UK. This matter was discussed at the British Hallmarking Council meeting on Monday 2nd April 2012, the first held since the query from Southampton Trading Standards. 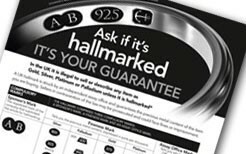 The British Hallmarking Council is made up of current and former Trading Standards officers, lawyers, trade members, lay members and members appointed by the four Assay Offices. All meetings are also attended by the four Assay Masters and by representatives of the National Measurement Office, which is the sponsoring body of the British Hallmarking Council and is an executive agency for the Department of Business Innovation and Skills, the Government Ministry responsible for hallmarking legislation. In the UK, the Hallmarking Act 1973 s1 authorises the use of specified descriptions only in the course of sale or supply of gold, silver, platinum and palladium in the course of a business or Those descriptions are set out in Schedule 1 of the Act which makes no reference to the term ‘bonded gold’. The Hallmarking Act does allow the terms ‘gold plated’ and ‘rolled gold’. Nevertheless the British Hallmarking Council was of the view that ‘bonded gold’ is very similar to ‘rolled gold’ and would have been allowed by the Hallmarking Act in 1973 had the process been invented when the statute was drafted. In the circumstances, the Hallmarking Act 1973 is outdated and the British Hallmarking Council therefore concluded that use of the description ‘bonded gold’ should not be the subject of any enforcement action and, by implication, could be used in the same way as the permitted descriptions of articles as ‘rolled gold’ or ‘gold plated’. The ‘bonded gold’ layer must be of a fineness of at least 375 parts per thousand and of a fineness recognised in the This means that ‘bonded gold’ of apparently 10K can only be described as 9 carat in the UK. ‘Bonded gold’ on a base metal core cannot be hallmarked. 2.2 ‘Bonded Gold’ on a silver core. ‘Bonded gold’ on a silver core can be hallmarked with a full silver hallmark only, the same as for a ‘gold plated’ silver article (silver gilt) or a ‘rolled gold’ silver article. NB Gold plated silver articles, rolled gold silver articles and bonded gold silver articles are not covered by the ‘mixed metal’ amendment to the Hallmarking Act (2007). Other than the silver hallmark or a 925 stamp on underweight items, no other standalone gold fineness marks are permitted on the bonded gold articles, because they are potentially confusing and misleading to the UK. It is not permitted additionally to mark the article 9K, 10K, 14K, 18K etc, nor can the article be marked 375, 416, 585, 750 etc. For the same reasons, ‘American’ style mixed marks are not permitted either, for example 925 1/20 14K. This is the same as it has always been for gold plated and rolled gold articles under the Hallmarking Act 1973 in the UK. A gold fineness mark (not hallmark) is allowed if it is immediately preceded or followed by the words ‘bonded gold’, ‘rolled gold’ or ‘gold plated’. For example an article with a silver hallmark (or 925 stamp on underweight articles) can be marked as follows ‘925 & 18ct bonded gold/rolled gold/gold plated’. This guidance applies to all bonded gold, rolled gold and gold plated silver articles below the 7.78 gram exemption weight for hallmarking, as well as for those requiring hallmarking. The ‘exemption’ is an exemption from hallmarking itself, not from the requirements of every other part of the Hallmarking Act 1973. ASSAYING is to determine whether the precious metal content of the alloy meets the required standard.